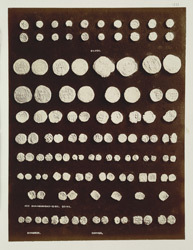 Photograph of a group of silver and copper coins from Brahmanabad in the Hyderabad District of Sindh in Pakistan, taken by Henry Cousens in 1896-7. Cousens wrote in The Antiquities of Sind, "In rows 8 and 9, on plate CII [this image], will be seen very thin copper pieces, more or less rectangular in shape, bearing sundry old devanagari letters stamped upon them, but not sufficient to enable us to read any word or name. The last ones, at the right ends of the rows are upside down: they are stamped with the same letters as the last but one in row 8...the remaining coins, figured upon the plate, are Arab coins in silver and copper, the upper two rows being in silver. Some of these, the larger and thinner ones, in the rows 3, 4 and 5, were probably imported by the Arabs for use in the province, whilst the smaller, thicker, and stumpy ones were, without doubt, minted in the country..."